If a neutral point is required or not available in case of delta connections and bus bar points, a zig-zig transformer is used. Earthed transformer are used for providing the neutral pint for such cases. 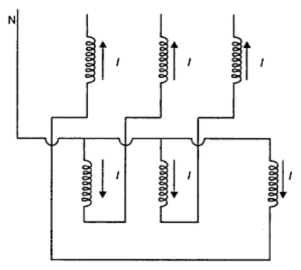 It is a core-type transformer having three limbs built-up in the same manner as that of a power transformer. Each limb accommodates two equally-spaced windings and the way they are connected is shown in the Fig. 1. It will be seen that the current in the two halves of the winding on each limb acts in opposite directions. These currents do not allow undeserving harmonics to prevail in the circuit, and thereby, the stresses on the insulation of the transformer are considerably reduced. The impedance of the earthing transformers is quite low, and therefore, the fault current will be quite high. 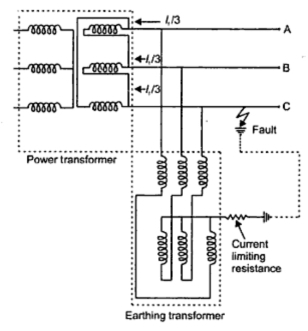 The magnitude of the fault current is limited by inserting resistance either in the neutral circuit as shown in Fig. 2 or in the windings of the earthing transformer. Components of various currents flowing under the conditions are also shown therein. The terminals of the earthing transformers are soldered to the power transformer for obtaining a solid connection between them. The capacity of the earthing transformer is denoted by the fault current it is capable of handling. Under normal operating conditions, it is only iron losses that are continuously present; copper losses are present only when the fault occurs. These copper losses are present only for short periods due to the short duration of fault (in the order of a few seconds).